Rustic décor—the perfectly imperfect way to add an essence of nonchalance and laid-back conviviality to any area of your home. But why are rustic interiors so popular? Is it the shabby-chic elegance that evokes a casual disregard for precision and exactitude? Or, perhaps it is the innate homeliness of exposed timber, well-built furniture, and comfortable modesty? Whatever the reason may be, rustic décor remains a robust crowd-pleaser, and an archetypal British interior trend. Today on homify we are looking at this fashionable and celebrated domestic movement, which can be implemented in every room of the house. Check out the following stunning examples below, and get some smart ideas for your stylishly renovated rustic style home. When we think of rustic interiors, we often imagine spaces that evoke a sense of the countryside and a bucolic ambience. This kitchen is different. Contemporary style blends effortlessly with rustic charm in this outstanding cooking space from Clifton Interiors. An AGA cooker takes centre stage and is flanked by statement lighting, and a glass splashback. The wall is exposed masonry, and that contrasts nicely with the polished marble island. The vaulted ceiling is the rustic icing on the cake, which leaves the space feeling unbelievably cool, calm, and sophisticatedly elegant. If you are working with a small space, you probably have avoided rustic interiors in favour of more modern styles, as their homeliness and warmth can create a sense of closed-in and cloistered ambience. This needn’t be the case, as very stylishly indicated in this example. 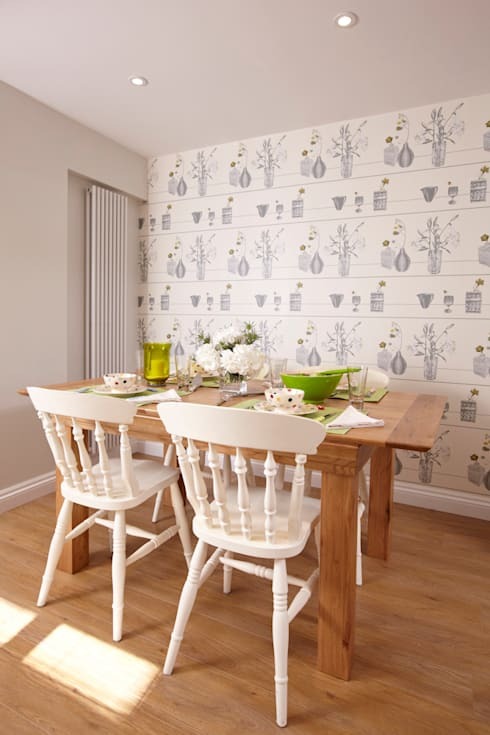 Decorated with a rustic timber dining table and timeless white chairs, this space is small yet comfortable and surprisingly spacious. Add some charming wallpaper, rustic table linen, and light timber floorboards for a space that evokes a sense of rustic cottage allure. Simple yet stylish—this bedroom is a stunning illustration of how rustic design can be cleverly combined with modern conveniences, to create a space that is practical, clean, and fresh. Think simple and neutral bed linen, floor lamps and minimal embellishment. In this space the rustic features of the loft speak for themselves, and the furniture is added to complement the architectural design of the room. Paired with the exposed timber beams, the space is white and crisp, with a sense of contemporary charm and rustic elegance. 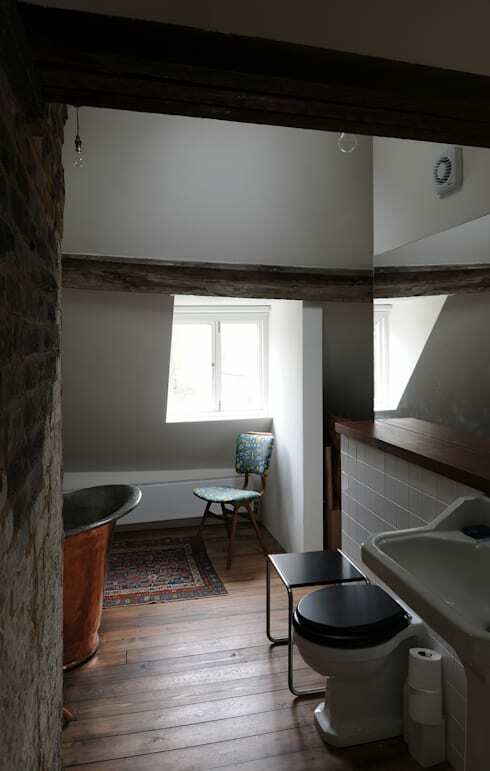 This rustic bathroom is a brilliant example of a stylishly renovated space that has managed to retain and include many original and bucolic features, which in turn ensure its authenticity and ambience. Replete with copper tub, exposed timber ceiling beams, and raw brick wall, this wash space is anything but ordinary. In addition to the rustic features, the space has retained its timber floorboards which house a Persian style rug and adds to the elegance and sophistication of the design. This living room epitomises ‘rustic’. 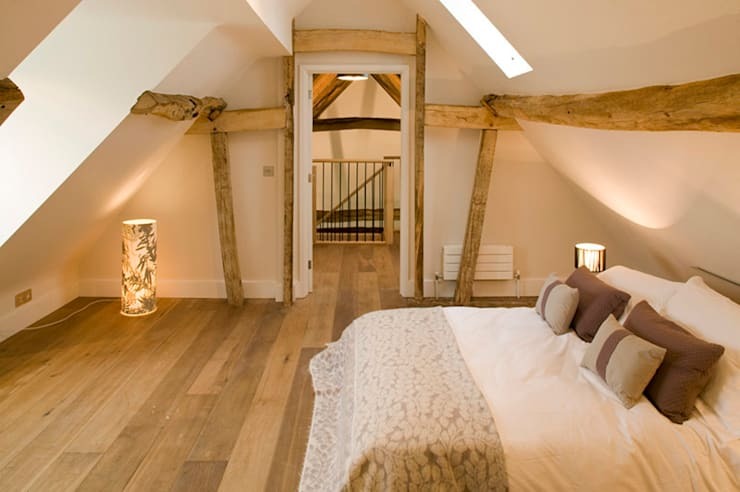 From the gorgeous vaulted ceiling with original timber beams, to the wood burner heating the open living space. 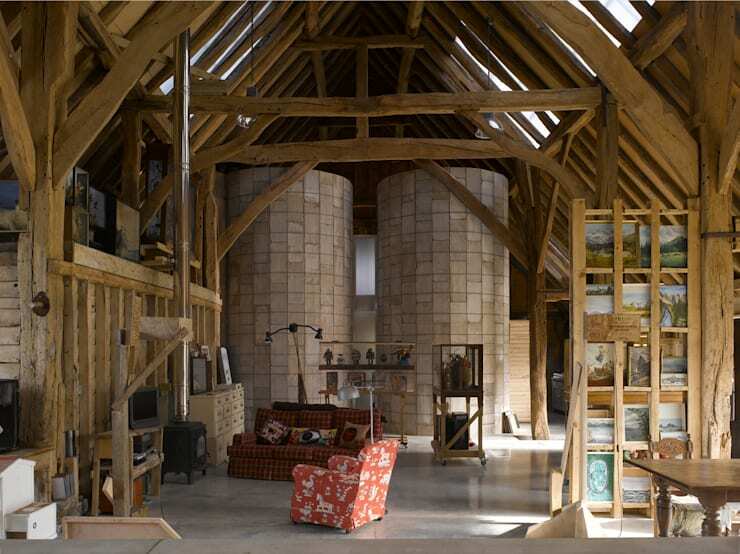 The essence of this room is truly outstanding, a mixture of contemporary interior trends and design are paired with a perfect restoration of a colossal 18th century barn. This home office is just oozing style and charm—from the vintage desk to the kitschy wallpaper, the space blends industrial with rustic and the result is fabulous. To achieve this look in your own abode, it is time to hit the second hand stores, and start rummaging for stylish vintage furniture. 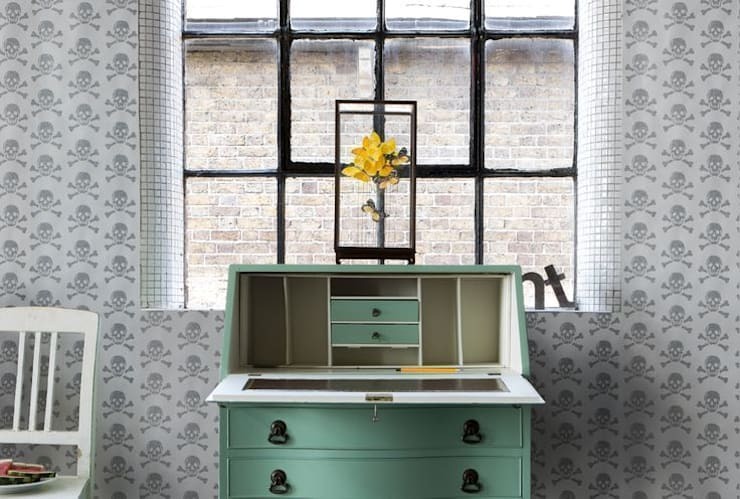 This desk has been lovingly restored and looks wonderful against the wallpaper which, until closer inspection, is not noticeably a skull and crossbones motif .